Edheads Virtual Knee Surgery Game - Learn How Knee Surgery Is Performed! Edheads virtual knee surgery game is a really cool way to actually get a hands on crash course on a lot of orthopedic procedures like partial knee replacement and hip resurfacing. But that’s not all, this super cool website offers other interactive orthopedic games. How about Edheads virtual knee surgery or virtual hip surgery? Edheads virtual knee surgery game recreates all the steps leading to the knee surgery starting with the reception desk followed by the OR hallways asking you interactive questions along the way. At the next step of the Edheads virtual knee surgery, you will be asked to choose from a variety of surgical instruments that you think you might need to perform the virtual knee surgery. Before you proceed with Edheads virtual knee surgery, you will be prompted to check your patient’s vital signs in order to determine if the patient is ready for surgery. The next segment of the Edheads virtual knee surgery focuses on prepping for surgery by sanitizing and draping the leg and foot surfaces. You will be guided by voice or subtitle commentaries through each part of the surgery from the first incision to the final suture stitching. At the end of the virtual procedures you can see the actual surgery photos, be warned that they are quite graphic in nature. 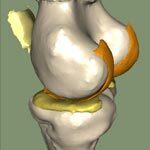 Edheads virtual knee surgery uses all the medical protocol steps and surgical strategies the best orthopedic surgeons currently employ to perform partial knee replacement, hip resurfacing and all other orthopedic procedures. Edheads virtual knee surgery is quite exciting because it makes you feel like a real orthopedic surgeon and is absolutely free, so give it a try today.